My husband and I live in Roanoke, Virginia where we have retired and spend as much time as possible with our daughter, her husband and four grandsons. The grandsons are super busy with their activities(mostly sports) but each has learned basic sewing skills and how to use a sewing machine. Sewing and fiber arts have always been a part of my life. My grandmother taught us how to sew and for many years I made clothing. 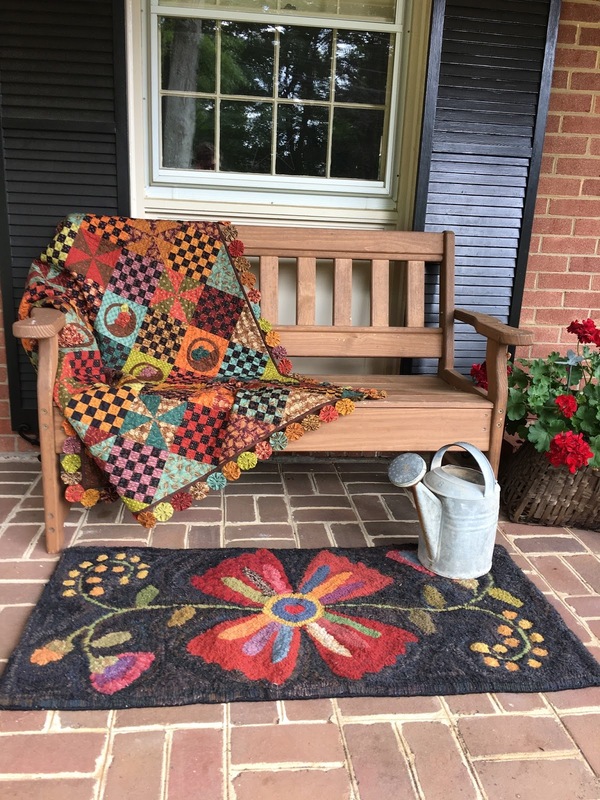 The first quilt was a gift for my mother to go in her primitive/country style home. That was approximately 25 years ago and from then on I have only made quilts. During this time I have taken many classes, attended lectures and attended large and small shows learning something from each. Not only does the creativity and process of quilting give me great joy but has also provided a common interest for myself and my cousin. We lived too far apart for many years to spend much time together. After our children were grown and we both retired, quilting gave us something to share. 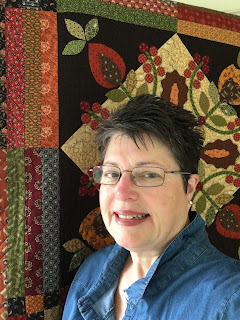 Now we take classes together, share our stashes, make quilts together and several years ago went to the Houston Quilt Festival. Additionally we get together for a week twice a year, along with my sister who hooks rugs, for a “cousins” retreat. An added benefit is that she is a great cook. So much fun! 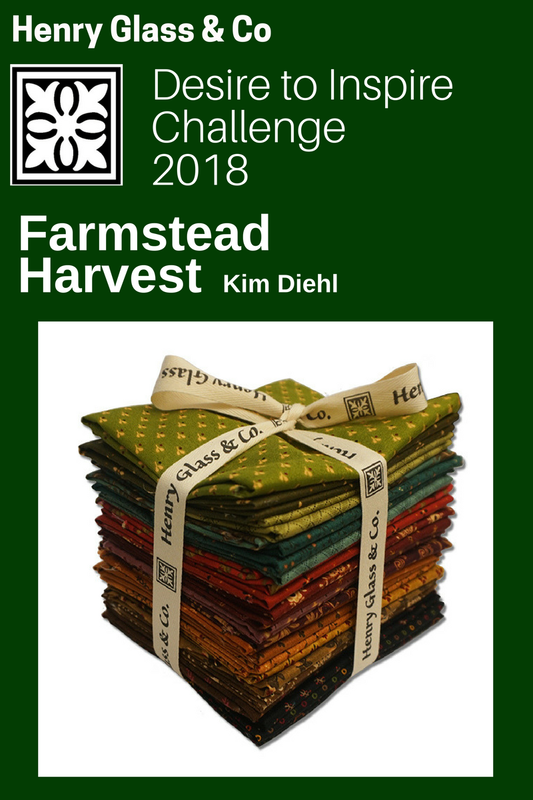 It was wonderful to have the opportunity to work with fabric designed by Kim Diehl. Her style and color palette are my favorites and twice I have had the opportunity to take classes from her. She was a pleasure to meet and learn from and provided a machine appliqué method that gave the result I wanted. This has been an exciting challenge. Thanks again for the opportunity. 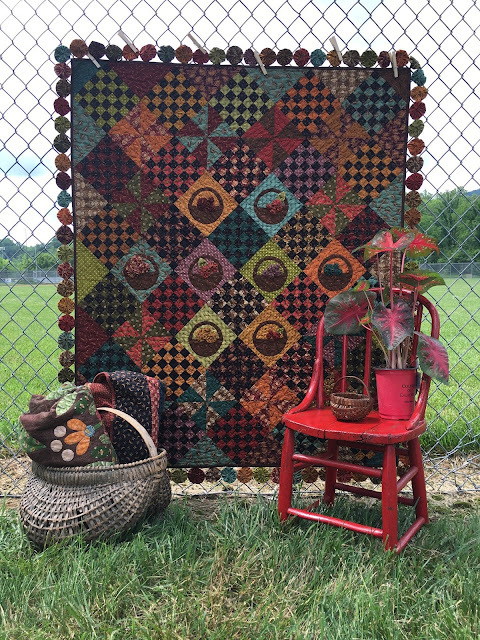 The quilt is stunning, and I like the rug too! You not only met the challenge, you blew it away. Congratulations! Beautiful! Nice job well done!! What a beautiful quilt. You used the fabric so creatively and with so much style. The rug your sister made is pretty darn nice as well. Beautiful work. A job well done! Wow! Gorgeous quilt...you are so very talented. Beautiful quilt, and I love that you translated a pattern into rug hooking!! !